OK, so among the changes I mentioned below is that now I work for a large law firm. I had thought that I’d already been working at a large firm for the past four years. (A firm with about 140 attorneys is among the top five or six largest law firms in a town like good old Milwaukee). But the firm I work for now (although I’m based mostly our of the tiny Milwaukee satellite office), is huge. Over 660 attorneys nationwide huge, and a member of “Am Law 100” (I’m not even sure what that really is). Also, according to a new report (that I read about on the firm’s Intranet) it is now the 98th highest grossing law firm in the world. Some of their marketing materials I read also boasted that they are “among the country’s 70 largest firms.” I thought that was pretty funny. Most people don’t go around bragging about being one of the top 70th of anything…. But anyway, it’s new and interesting to be exposed to a company of this size. I get intra-firm e-mails all day from all around the country. And they’re from my co-workers, but they might as well be from strangers, almost. Of course the people I work most closely with are ‘real’ people, and very nice. But I’m still getting used to the phrase “time-zone appropriate food will served,” which keeps popping up in the description of the lunch that can be expected for various firm-wide teleconferences and satellite video meetings. I traveled to and from the Chicago office today, and my exploration of mega-firm continues. My route from the Chicago train station to the Chicago office can be described as walk to the Sears Tower, turn left, walk six blocks. Pretty simple. 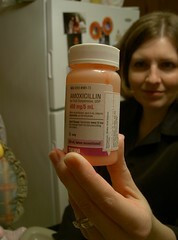 So Sarah’s over the ear infection that I last blogged about. But who knew – the antibiotics caused her to have a ‘yeast rash’ on her bottom! I’d never seen that before, but Sarah broke out in the worst-imaginable-looking red, almost blistery, diaper rash, and I figured out, thanks to some Googling, what the problem was. A lot of lotramin and a Dr. visit later, and she’s fine again. It’s going to be a Christmas letter for the record books. Almost everything about our lives has changed since the last holiday season. New house, new daycare, new bi-weekly housecleaner, new tenants in the old house, new status as long-distance-landlords with respect to the old house, new baby, new degree (Paul graduated from law school), and now, new job for Kelly(!) and, as of today, new (well, used) minivan for Kelly, too. That’s right, I said new job for Kelly. Life is full of surprises, and this was a good opportunity. So now I’m a newly initiated member of a subculture of Milwaukee people (when I show up at the station in the early morning, I tend to think of us as ‘the bedraggled masses’) who travel on the 6:15 a.m. Hiawatha Service Amtrack train to Chicago (I come back on the 3:15 p.m.) occasionally for work. (My new firm has a large office in Chicago that need to visit sometimes). It’s a new situation for us, but a good one. I think I’ll be fine if we don’t have too many other changes this year, though. We may just be up to our quota for the year!! 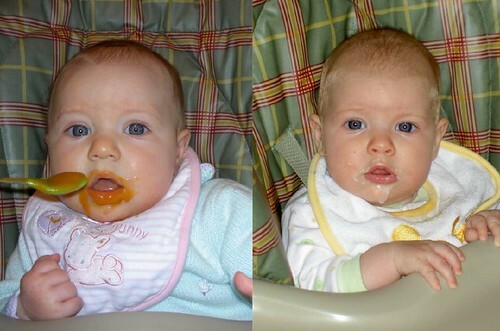 It’s Applesauce All Over Again! (I can only hope that Yogi Berra would be proud of the title). What I mean by it is that history is repeating itself – and that the Applesauce is, literally, getting all over the place again. Once again, we have a little, four month old girl with an ear infection. 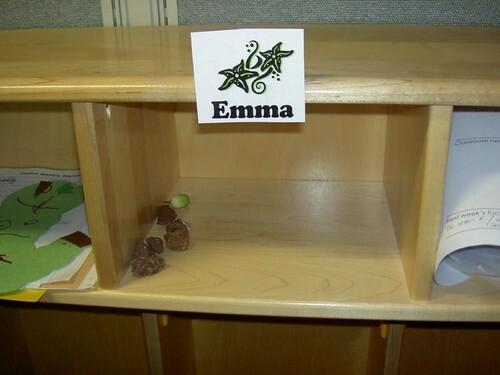 (Well, maybe Emma was five months). 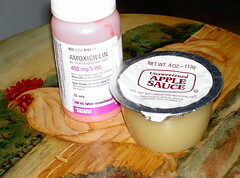 And once again, the attempt at getting the Amoxicillan down via the drugstore-provide syringe was a total bust. So I’ve got to sneak it into some applesauce and spoon feed it, as best I can to a girl who’s still figuring out how spoon feeding works. I’m willing to do anything, though, to get the little gal feeling better. She’s had a cold, but was getting over it, and then, suddenly, got extra cranky, and her fever spiked up to 103.1. It was a little slow on the uptake, but finally connected all the dots this morning when I saw her tugging at her ear. (All this, is textbook ear infection by the way). So we went to the Dr., and got that ear diagnosed. Infected, indeed. (Not, incidentally, on the side she tugged at this morning, but the Dr. says it’s common that babies pull on the non-infected side – I don’t know why). We also got some pain drops to put into her ear to keep her more comfortable until the antibiotic kicks in. 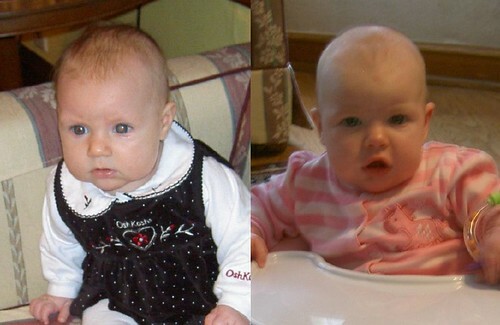 But I’m having flashbacks to January of 2006 (which is when I took the pictures in this post – no current ones yet), when we went through this with then small Emma. Except that I feel much calmer, and generally much less worried than the first time around. I now know that this just happens with babies, and that all will be well… The first time around, I was never 100% sure on that last part. 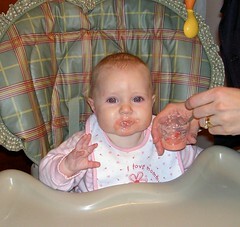 Posted in Baby Chronicles, Life in the Koog House | Comments Off on It’s Applesauce All Over Again! Two Rights Don’t Make it Right! 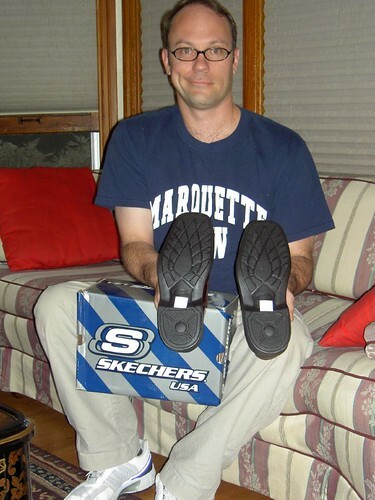 Paul had been eagerly awating a replacement pair of shoes in the mail (the eariler pair had been defective). But when he opened the box, he discovered that he had been sent two RIGHT shoes!!! So now he’ll be waiting a little longer. By the way, check out that ‘Marquette Law’ t-shirt he’s wearing. Our new J.D. in the house has been busy picking us various legal work over the summer under his own, virtual, ‘shingle,’ but is still looking to land the right firm position. He had an interview today for a nice possible position. Everyone’s good mental vibes are welcomed – we’d be thrilled if this one would work out. (The call-back interview should take place a couple of weeks from now). I’ll post any significant updates on the blog. Posted in Career, Life in the Koog House | Comments Off on Two Rights Don’t Make it Right! I was so sad to see this sight at the doorstep yesterday morning! 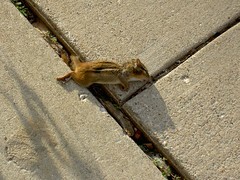 One of our cats killed this cute little chipmunk!!! Luckily, today (the day after I took this picture), I DID see a very much alive and apparently cheerful little chipmunk scampering about in our garden. So it’s good to know that our cats haven’t decimated the local chimpmunk population altogether. 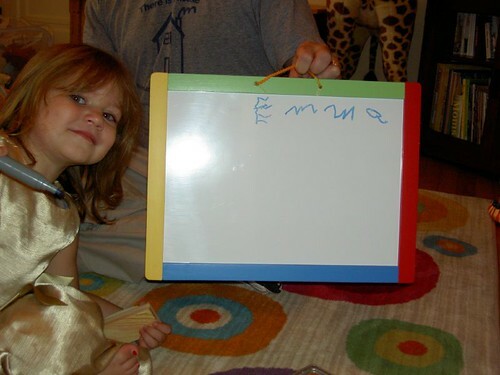 Emma just sat down and wrote her name all by herself this past weekend! Let’s hear it for her teachers at pre-school!!! We’re so proud of our little speller! Posted in Life in the Koog House, Passing Through Preschool, Proud Mama | Comments Off on Ta-Da! 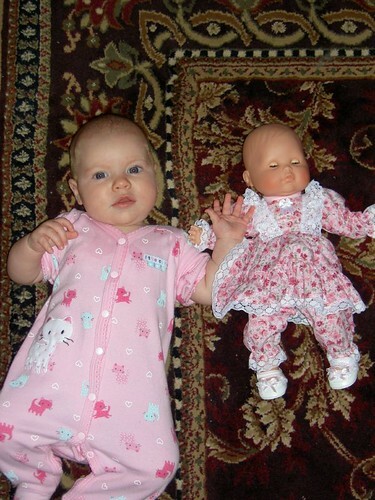 Posted in Baby Chronicles | Comments Off on Sarah and the Doppelgaenger! 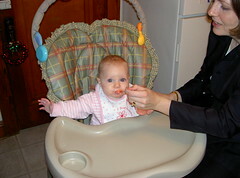 Our little cutie has had her first couple of tries at eating rice cereal now. So far, most of it gets spit back out, but that won’t last for long. She also seems to be growing in some more fuzzy baby hair! 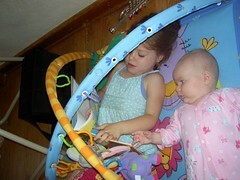 And Big Sister LOVES to spend time playing with Baby on her play mat! 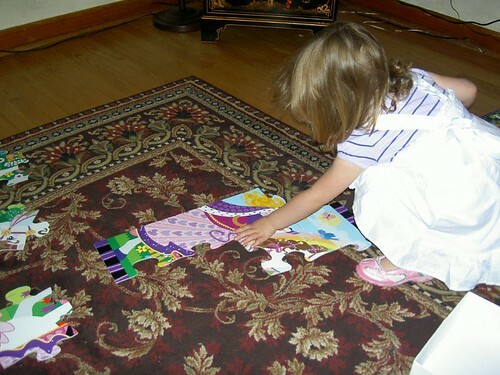 Recently, she joined Little Sister on the mat to share both a reading of ‘The Little Engine That Could’ (including the quote “Me pull the likes of YOU??!? 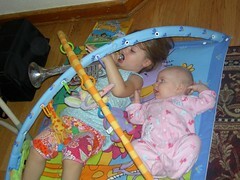 Indeed NOT’), and some toy trumpet playing. Baby seems to enjoy it.